Carpet stains – pretty much every house has them. There are countless numbers of sprays, brushes, and machines to help us address these persistent reminders of the dropped meatball or that spilled glass of juice. Some cleaners deliver more promises than stain removal, but Spot Shot actually does what it claims to do – quickly and easily removes stains – even mystery ones. Spot Shot safely eliminates even tough old carpet stains from pet stains to wine, grease, food and more and Spot Shot has now launched the $5,000 Living Room Makeover sweepstakes! Oh gosh – where to begin when testing Spot Shot Instant Carpet Stain Remover? Should it be those brown dirt marks by the front door? Or maybe these mystery black spots that appeared sometime last year? Oh wait – what is that bright red spot? Who’s been eating Popsicles by the couch? I guess that spot is as good a stain as any. Challenge: Bright red spot that looks suspiciously like melted red Popsicle. Age of spot: I’m guessing between 3-5 days. Step 1: Spray Spot Shot Instant Carpet Stain Remover onto the stain. The spray comes out fast and strong, so one good spritz is all it takes. Make sure not saturate the carpet. Step 2: For older stains, let Spot Shot soak into the stain for about 60 seconds. 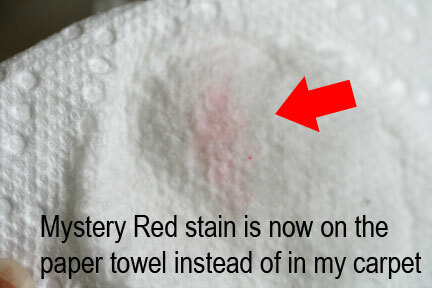 Then use a clean dry cloth (or paper towel like I used) to carefully blot the area. Still see a stain? Repeat step 2 until the stain disappears. After 2 rounds of Spot Shot, this is how my carpet looked. Not bad, eh? After you’re finished with the stain removal process, blot the area with cool water and then blot dry. It really is SO easy – no scrubbing, soaking for hours, or anything. Just spray and blot. Buoyed by my success with the first stain, I decided to tackle a stain that was decidedly harder. Those mystery black spots that appears on the carpet over a year ago. 4 dots of black that have resisted several carpet cleaners and scrubs already. I was amazed – Spot Shot actually cleared up those spots as well. I did take pictures, but they didn’t effectively capture the true stain removing power for that set of stains. But I’ll leave you with a final before/after picture of a black stain that was lurking by the sofa. 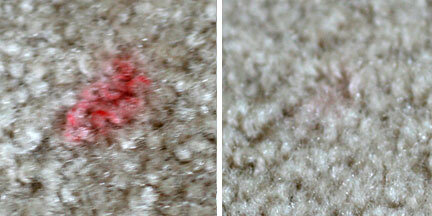 I was totally amazed at how well, and how quickly, Spot Shot was able to remove even super old stains on my carpet. Spot Shot is a serious Instant Carpet Stain Remover that actually attacks and removes tough carpet stains. Spot Shot is available in aerosol or trigger spray formats in stores nation-wide. Before heading to the store, make sure you print this coupon for $1.00 off Spot Shot. If you like to win prizes, then make sure you enter the Spot Shot $5,000 Living Room Makeover Sweepstakes. You can enter daily to win the grand prize and for a chance to win one of their weekly prizes as well! The Sweepstakes ends on August 8, 2011 so there are still lots of opportunities to win! Enter online at http://www.spotshot.com/nominee-sweepstakes/ for a chance to win the $5,000 grand-prize (awarded via check) or a prize pack of coupons for Spot Shot, 2000 Flushes, X-14 and Carpet Fresh – all products that will help get your home sparkling clean! For the latest news about Austin and the Living Room Makeover sweepstakes, visit the Stain Fighting Community Facebook page. Leave a comment sharing which of your carpet stains will be obliterated by Spot Shot Instant Carpet Stain Remover. +1 Enter the Spot Shot $5,000 Living Room Sweepstakes. Giveaway ends at 11:59 PM EST, August 5, 2011. I would use it on pet stains. I like Stain Fighting Community on FB with my username Mary Happymommy. I’d use Spot Shot to remove juice and mud stains from the rug! I have a massive German Shepherd who had quite a few accidents as a puppy. This would really give my mom peace of mind. I have a 18 year old cat who sometimes has accidents so I would use it for that. New follower from SheSpeaks Blogger Society! thanks for the sweepstakes link! I have a dark stain on my carpet- dunno what it is, it was there before we moved it. Maybe this would take care of it. I follow WiC on twitter @giveawaysetc. Entered the Spot Shot $5,000 Living Room Sweepstakes. The marinara sauce on the living room floor! I have a stain that is pink in our bedroom from previous owners that would be the first stain I would tackle. I’d use it to remove food stains! I would say pet stains from our malamute, when we first got her. It would have to be a stain from the kitties dry catfood. It leaves a dark stain on the carpet. The first stains I want to use Spot Shot on is the cat throwup/hairball stains, and other pet stains. Thanks for the chance! I entered the Spot Shot $5,000 Living Room Sweepstakes! Spots that are just mysteries, I have no idea where they came from! I’m entered into the sweepstakes! I “Liked” the Stain Fighting Community on Facebook and thanked them for this giveaway! My daughter has new carpet and a nice fresh mustard stain on it too…Spot Shot could probably take it out. I hope it will take out a grape juice stain. The small, scattered purple spots on the light brown carpet, where my nephew dripped his grape juice, will hopefully be gone after using Spot Shot! Thanks! I entered the Spot Shot $5,000 Living Room Sweepstakes. I “Like” the Stain Fighting Community on Facebook as Terri Winsome and I told them you sent me. I “Like” The WiC Project on Facebook as Terri Winsome. I follow The WiC Project on Twitter as @dahbou. I follow The WiC Project on Google Friend Connect as Terri. I have a mystery spot on the carpet in my living room that I’m going to after first. I entered the Spot Short $5000 Living Room Makeover sweepstakes. Enter the Spot Shot $5,000 Living Room Sweepstakes. I have dirt stains from the pup running around the house after a rain day. I tried to catch him before the mess to get a bath lol. Oh well. Thanks! I have lots of little gray stains on my rug in front of the couch…likely caused bymy three year old. I’m a facebook fan of Stain Fighting Community under username Jennie Tilson. This product is amazing! I should buy it by the case! With 4 kids and 3 dogs and 3 cats, I use it almost everyday! A juice stain that my son had gotten on our rug under our couch. I have a stain made by spaghetti sauce that is not coming out. “Like” the Stain Fighting Community on Facebook. Old soda stains will be obliterated! The barf stain in our family room will be obliterated by Spot Shot! The kool aid stain by the couch!! Thanks! Entered the Spot Shot contest. Thanks! Like Stain Fighting Community on FB (Contest KAO). Thanks. We’ve got black spots as well! They can’t be grease someone stepped in in the garage because they aren’t a line getting smaller or anything like that. WHAT ARE THEY AND WHERE DID THEY COME FROM!!! Milk seems to get spilled the most on the rugs. I “Like” Stain Fighting Community on Faebook. I would use it in my girls’ room to get rid of the tye dye color all over their floor. It’s a mess in there. thank you! Spilled chocolate milk would be my stain. The spot where my bunnies have gone to the bathroom beside the litter box instead of in it. I don’t have any carpet stains. I am sure Spot Shot Instant Carpet Stain Remover will remove any future carpet stains that might happen in the future. A pasta stain using spot shot. Like” the Stain Fighting Community on FB. Mystery stain on my stairs! Unfortunately, I have quite a few carpet stains courtesy of my 15-year-old cat. He has digestion problems. BUT I love him! I entered the Spot Shot sweepstakes. “Like” The Stainfighting Community on Facebook username mimi2tnb. “Like” The WiC Project on Facebook username mimi2tnb. “Follow” The WiC Project on Twitter @oneinpurpose. “Follow” The WiC Project on GFC as Mimi to Tee and Bee. I’ve got a mystery stain by the dining room table that will be obliterated by Spot Shot Instant Carpet Stain Remover! Cereal spills are the worst in my house. Beet juice carpet stains will be obliterated by Spot Shot Instant Carpet Stain Remover. This might get rid of the red hawaiian punch stain on my area rug. Tea stains will be obliterated by Spot Shot! We have a coffee stain on our dining room carpet that has been driving us crazy for about a year now – I’d love to see it Spot Shot can tackle it! I am hoping a red koolaide stan will be obliterated by Spot Shot Instant Carpet Stain Remover! I have pet stains on my Persian rug in my dining room that I want to tackle. I wonder if it would remove hair dye I got on my bathroom carpet. I luv my 3 kitties…once in a while the old hairball gets coughed up and if not found soon enough can leave a nasty stain. I’d like to Spot Shot them, thanks! I am hoping that the Spaghetti-O with Meatballs carpet stain will come out with the Spot Shot. Hopefully the fruit punch that my son spilled on the carpet. I have some coffee stains on my carpet that I would like to Spot Shot away. I have mystery stain that appeared by my chair in the living room, it’s brown. Like the Stain Fighting Community on FB. Right at this moment my biggest stain problem is that my teen daughter took a bag with ice in it to a game and brought it home, set it in her bedroom floor, and it melted and stained and stinks. Ick. I also have three dogs inside. Need I say more? Lol. Like Stain Fighting Community on FB. I hope it will work on some pet stains. Like the WiC Project on FB. I would use it on drink stains. hopefully it’ll get out some pet stains and the coke that my brother spilled. Hopefully it will get out a mustard stain. I’m hoping the red wine stain will be obliterated by spot shot. I’m hoping an old juice stain might be eliminated by this! I have a dark gravy stain on a light area rug in the dining room. Even though I treated it almost immediately it never completely went away. I’d like to try Spot Shot. Juice and pet stains, thanks! Following WiCProject via Twitter (@Hotsnotty2), Thanks! I HOPE that the horrible orange clay they call dirt down here will disappear from my carpets! I hope the Spot Shot will be able to get a coffee stain out of my carpet. Those nasty pet stains, eww! Mud and other gross stuff the dogs drag in on their feet. I use Spot Shot to remove food stains from the dining room carpet. 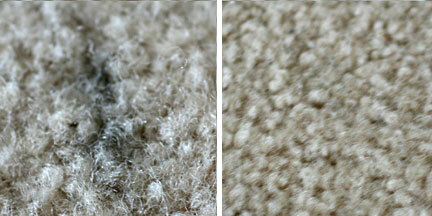 I have a few mystery spots on my bedroom carpet that I would LOVE to get rid of! I entered their contest! Would LOVE 5,000 for a livingroom make over! I’d try it on the stain a damp colored cardboard box left on my hall carpet. My puppy left me a surprise that stained my living room carpet and have tried just about everything else so I would be happy to try this on that stain. I would use on kitty stains! Great giveaway thank you so much! I like the stain fight on FB! I like yu on FB! I have a couple of Kool Aid stains from the grand kids – help! I’m hoping the red jello will come out. blood stains. I get a lot of nose bleeds because of allergies. I hope the red sauce stains will be obliterated. I’ve got dogs with waggy tails who are always knocking things over. I like Stain Fighting Community on FB!